Before La La Land, there was The Umbrellas of Cherbourg. Set in northwest France in the late 50s, the Jacques Demy-directed movie musical (as well as his next, 1967’s The Young Girls of Rochefort) was one of Damien Chazelle’s references when making the 2016 film. Catherine Deneuve plays Geneviève, a lovesick 17 year old whose boyfriend Guy (Nino Castelnuovo) is drafted to the Algerian War. The separation forces the pair to move on from each other, resulting in a bittersweet, snow-showered reunion some years later. “The film used colour like a singing Matisse,” said Demy of his Oscar-nominated and Palme d’Or-winning masterpiece. Thanks to restorations pushed forward by Demy’s widow Agnès Varda, The Umbrellas of Cherbourg’s enchanting colours are today just as vivid, more than 50 years after its original release. It’s a singular viewing experience – dream-like production and costume design and dialogue entirely sung in conversational tunes combine with a story grounded in emotional realism. To mark its lead actress’ birthday this week, we look to the film that launched Deneuve’s career. The Umbrellas of Cherbourg is renowned for its arresting production design, and most specifically, its wallpapers. Saccharine pink and green stripes line the umbrella shop walls; striking blue and purple florals appear in Geneviève’s bedroom; blooming orange and fuschia flowers swirl around the mother and daughter’s kitchen; magenta and gold brocade colour the walls in a late-night hotel. 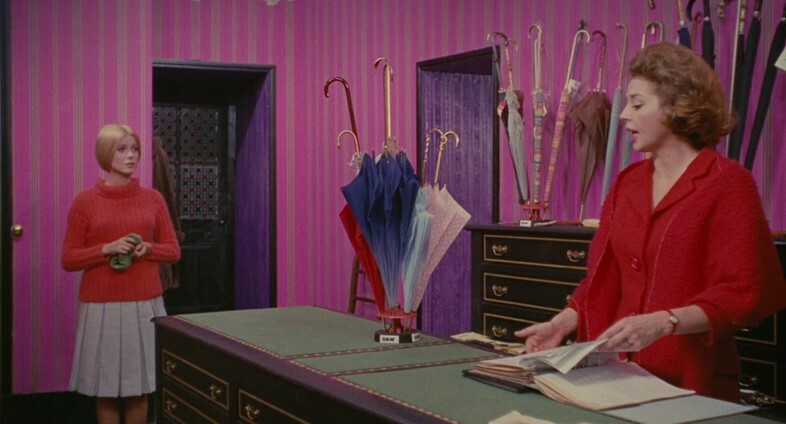 The film’s costume designer, set designer and cinematographer (Jacqueline Moreau, Bernard Evein and Jean Rabier) would work together to co-ordinate the colour palettes, with Moreau often creating clothes to precisely match the decor’s exquisite shades. The film’s costumes were not only meticulously matched to its rainbow-hued wallpapers, but also to the characters’ moods. When Guy is at his lowest point, bitter and short-tempered, he wears sloppy, stained overalls to work in the garage, while his colleagues’ boiler suits are crisp; Madame Emery’s anger upon learning of Geneviève’s pregnancy is illustrated with her scarlet twin-set; and when the despondent Geneviève is feeling blue she wears it too, crying over Guy in a powdery Peter Pan-collared dress. A teenager for the majority of the film, Geneviève’s innocence is highlighted through the various ribbons and accessories she wears in her hair. Deneuve’s signature fringe was swept reluctantly from her face – the story goes that Agnès Varda convinced the reluctant emerging actress Deneuve to change her hair for The Umbrellas of Cherbourg. Genevièves bows, strings and ties match her bonbon-coloured costumes (and the wallpaper, naturally) and it’s a sign of how she’s moved on when, in the film’s final scene, her hair is fixed in an elaborate up-do and secured with a black ribbon. Walking the rainy streets of Cherbourg arm in arm, Geneviève and Guy use not umbrellas to shield from the showers (see lesson number five) but Burberry trench coats. In the tumultuous spring weather the jackets often billow slightly, offering a flash of that signature camel check. After the couple part at the train station, each in their trench, neither is seen in a Burberry coat again – Guy wears a brown wool jacket upon his return to Cherbourg, while Geneviève adopts scallop-edged pea coats to cover her growing pregnancy. For a film with ‘umbrella’ in its title, the characters in The Umbrellas of Cherbourg make hardly any use of that rainy day accessory. The Emerys’ shop is decorated with them, and Geneviève spends many a melancholic minute rearranging and polishing their various brightly coloured iterations, but outside, in the elements, she will allow herself a drenching – right up until her final reunion with Guy, as they meet on a snowy night in Cherbourg. The abandoning of the umbrella becomes symbolic of the hardships Geneviève and Guy open themselves up to. According to Madame Emery, the right man should be like an umbrella. Of Roland Cassard, Geneviève’s suitor and eventual husband, the daughter comments that her mother “praise[s] him as you praise your umbrellas”. “He’ll protect you,” Madame Emery astutely responds.